Feria promotion details can be found on Shoppers Drugmart’s website. Once you log into your account and click on ‘All Offers’, you can see the Feria Shopper’s Optimum bonus points offer. You don’t need to bring in any coupon, once you purchase two Feria hair color products the bonus points will be automatically added to your account. 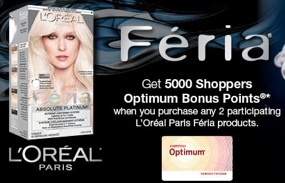 Feria promo is you get 5000 Shoppers Optimum Bonus Points when you purchase any two participating L’Oreal Paris Feria products. Feria hair colour promo is valid only in Shoppers Drug mart locations across Canada. Offer ends August 9, 2013. Also if you purchase Feria Wild Ombre – Ombre hair color you get a bonus entry into the Shoppers Dream Summer contest. See contest details here. Feria Ombré is the hottest haircolour trend, with celebrities and trend-setters alike rocking lightened locks. 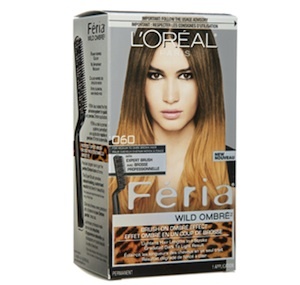 Now you can get Ombre at home for the first time ever with L’Oreal’s Feria Wild Ombres! Feria makes Ombre easy with its patented Expert Brush that lightens hair in a single stroke – and with no root application, it’s simple to keep up your Ombré style! Feria’s lightening formula blends perfectly to your unique haircolour – so no harsh lines – just naturally blended results! Feria’s conditioning shampoo, hair is deeply hydrated, leaving hair soft and manageable. Find your perfect Ombre shade among our portfolio of 4 shades designed to blend seamlessly to your natural colour – and unleash the wild in you.